Martin James Landau (/ˈlændaʊ/; June 20, 1928 – July 15, 2017) was an American actor, acting coach, producer, and editorial cartoonist. His career began in the 1950s, with early film appearances including a supporting role in Alfred Hitchcock's North by Northwest (1959). He played regular roles in the television series Mission: Impossible (for which he received several Emmy Award nominations and a Golden Globe Award) and Space: 1999. 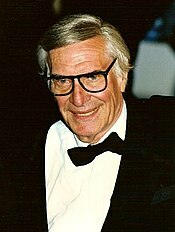 Landau received the Golden Globe Award for Best Supporting Actor – Motion Picture, as well as his first nomination for the Academy Award for Best Supporting Actor, for his role in Tucker: The Man and His Dream (1988); he received his second Oscar nomination for his appearance in Crimes and Misdemeanors (1989). His performance in the supporting role of Bela Lugosi in Ed Wood (1994) earned him an Academy Award, a Screen Actors Guild Award and a Golden Globe Award. He continued to perform in film and television, and headed the Hollywood branch of the Actors Studio until his death in July 2017. Landau was born on June 20, 1928, in Brooklyn, New York, the son of Selma (née Buchman) and Morris Landau. His family was Jewish. His father was an Austrian-born machinist who tried to rescue relatives from the Nazis. After attending both James Madison High School and the Pratt Institute, he found work at the New York Daily News. There he spent the next five years as an editorial cartoonist and worked alongside Gus Edson to produce the comic strip The Gumps. He quit the Daily News when he was 22 to concentrate on theater acting. "I told the picture editor I was going into the theater," he recalled. "I think he thought I was going to be an usher." After auditioning for the Actors Studio in 1955, Landau and Steve McQueen were the only applicants accepted out of 500 that applied. While there, he trained under Lee Strasberg, Elia Kazan, and Harold Clurman, and eventually became an executive director with the Studio alongside Mark Rydell and Sydney Pollack. Influenced by Charlie Chaplin and the escapism of the cinema, Landau pursued an acting career. He attended the Actors Studio, becoming good friends with James Dean. He recalled, "James Dean was my best friend. We were two young would-be and still-yet-to-work unemployed actors, dreaming out loud and enjoying every moment ... We'd spend lots of time talking about the future, our craft and our chances of success in this newly different, ever-changing modern world we were living in." He was also in the same class as Steve McQueen. In 1957, he made his Broadway debut in Middle of the Night. Landau made his first major film appearance in Alfred Hitchcock's North by Northwest (1959) as Leonard, the right-hand man of a criminal played by James Mason. He had featured roles in two 1960s epics, Cleopatra (1963) and The Greatest Story Ever Told, and played a ruthless killer in the western Nevada Smith (both 1965), which starred Steve McQueen. Landau played the role of master of disguise Rollin Hand in the US television series Mission: Impossible. Landau at first declined to be contracted by the show because he did not want it to interfere with his film career; instead, he was credited for "special guest appearances" during the first season. He became a full-time cast member in the second season, although the studio agreed (at Landau's request) to contract him only on a year-by-year basis rather than the then-standard five years. The role of Hand required Landau to perform a wide range of accents and characters, from dictators to thugs, and several episodes had him playing dual roles—not only Hand's impersonation, but also the person whom Hand is impersonating. Landau co-starred in the series with his then-wife Barbara Bain. In the mid-1970s, Landau and Bain returned to TV in the British science-fiction series Space: 1999 (first produced by Gerry Anderson in partnership with Sylvia Anderson, and later by Fred Freiberger). Critical response to Space: 1999 (also known as Moonbase Alpha) was unenthusiastic during its original run, and it was cancelled after two seasons. Landau was critical of the scripts and storylines, especially during the series' second season, but praised the cast and crew. He later wrote forewords to Space: 1999 co-star Barry Morse's theatrical memoir Remember with Advantages (2006) and Jim Smith's critical biography of Tim Burton. Following Space: 1999, Landau appeared in supporting roles in a number of films and TV series, including the TV film The Harlem Globetrotters on Gilligan's Island (1981), which again co-starred Bain (and marked the final time they appeared together on screen). He won an Oscar for Ed Wood (1994), a biopic in which he plays actor Bela Lugosi. Landau researched the role of Lugosi by watching about 25 old Lugosi movies and studying the Hungarian accent, which contributed to Lugosi's decline in acting. "I began to respect this guy and pity him," said Landau. "I saw the humor in him. This, for me, became a love letter to him, because he never got a chance to get out of that. I got a chance to make a comeback in my career. And I'm giving him one. I'm giving him the last role he never got." Landau also received a Screen Actors Guild Award, a Golden Globe Award and a Saturn Award for the role, as well as accolades from a number of critics groups. Gregory Walcott, who was in the film, watched the screening of it at the Motion Picture Academy and said that the Academy members "gave Landau a hearty, spontaneous applause over the end credits." Landau's film roles in the 1990s included a down-on-his-luck Hollywood producer in the comedy Mistress (1992) with Robert De Niro and as a judge in the dramas City Hall (1995) with Al Pacino and Rounders (1998) with Matt Damon. and Ready to Rumble in (1999). Landau provided the voice of Scorpion for the first two seasons of the 1990s Spider-Man television series. Landau left the series after two seasons when he won the Academy Award and lacked time for the series. He played the part of Jacob, son of Isaac in the TV miniseries Joseph. The story of Joseph and his life was shown in this 1995 film. He co starred with Ben Kingsley (Potiphar) and Paul Mercurio as Joseph. He played a supporting role in The Majestic (2001), starring Jim Carrey. The film received mostly negative reviews, although one reviewer wrote that "the lone outpost of authenticity is manned by Martin Landau, who gives a heartfelt performance," as an aging father who believes that his missing son has returned from World War II. In the early seasons of Without a Trace (2002–2009), Landau was nominated for an Emmy Award for his portrayal of the Alzheimer's-afflicted father of FBI Special Agent in Charge Jack Malone, the series' lead character. In 2006, he made a guest appearance in the series Entourage as a washed-up but determined and sympathetic Hollywood producer attempting to relive his glory days, a portrayal that earned him a second Emmy nomination. Landau appeared in the television film Have a Little Faith (2011) based on Mitch Albom's book of the same name, in which he played Rabbi Albert Lewis. Encouraged by his own mentor, Lee Strasberg, Landau also taught acting. Actors coached by him include Jack Nicholson and Anjelica Huston. In 2009, Landau and his Actors Studio colleagues, director Mark Rydell and writer Lyle Kessler, collaborated to produce the educational Total Picture Seminar, a two-day event covering the disciplines of acting, directing and writing for film. Landau married actress and former co-star Barbara Bain on January 31, 1957, and they divorced in 1993. They had two daughters, Susan and Juliet. On July 15, 2017, Landau died at the age of 89 at the Ronald Reagan UCLA Medical Center in Westwood, Los Angeles, California; he had been briefly hospitalized. The cause of death was hypovolemic shock brought on by internal bleeding and heart disease. Landau is buried at the Beth David Cemetery in Elmont, New York. ^ "Martin Landau Died from Massive Internal Bleeding". TMZ. 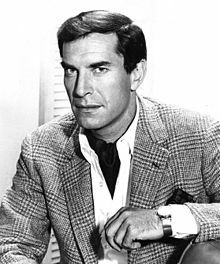 ^ a b "Martin Landau Died From Massive Internal Bleeding". TMZ. July 27, 2017. Retrieved July 27, 2017. ^ Gleiberman, Owen (July 19, 2017). "Martin Landau Was a Slyly Versatile Actor Who, in Late Middle Age, Attained Greatness". Variety. Retrieved July 21, 2017. ^ Wiegand, Chris (July 17, 2017). "Martin Landau obituary". The Guardian. ISSN 0261-3077. Retrieved July 21, 2017. ^ Gates, Anita (July 16, 2017). "Martin Landau, Actor Who Won an Oscar for 'Ed Wood,' Dies at 89". The New York Times. ^ Roberto Dominguez (July 16, 2017). "Martin Landau's first job was a cartoonist at the New York Daily News". New York Daily News. Retrieved July 16, 2017. ^ Lindsey, Robert. "Martin Landau Rolls Up in a New Vehicle", The New York Times, August 7, 1988. ^ a b c Susan King (March 12, 2016). "Martin Landau on his acting life with James Dean, Steve McQueen and now Christopher Plummer". Los Angeles Times. Retrieved July 16, 2017. ^ Burrows, Tim (October 12, 2012). "Martin Landau: 'I chose to play Leonard as gay'". The Telegraph. Retrieved July 16, 2017. ^ Patrick J. White (October 1, 1991). The Complete Mission: Impossible Dossier. Avon Books. ^ a b Herbie J. Pilato. "The Indestructible Mission: Impossible at 50". Emmy Awards. Retrieved July 16, 2017. ^ a b c "Martin Landau". Los Angeles Times. Retrieved July 16, 2017. ^ a b "Martin Landau-Space: 1999". Catacombs Remembrance Library. Retrieved July 16, 2017. ^ a b c d e Ralph Ellis (July 16, 2017). "Actor Martin Landau, star of 'Mission: Impossible,' dies at 89". CNN. Retrieved July 16, 2017. ^ Barry Morse (November 13, 2006). Remember With Advantages. McFarland & Company. ^ "The Harlem Globetrotters on Gilligan's Island". Hollwood.com. Retrieved July 16, 2017. ^ "Martin Landau Has Died At 89". Nerdist.com. July 16, 2017. Retrieved July 18, 2017. ^ "The Voices of Scorpion". Behind The Voice Actors. ^ "Have A Little Faith Begins Filming in Detroit on Monday June 20, 2011". On Location Vacations. July 1, 2011. Retrieved July 16, 2017. ^ Ron Rosenbaum (July 13, 1986). "The Creative Mind; Acting: The Method and Mystique of Jack Nicholson". The New York Times. Retrieved July 16, 2017. ^ "A One-Time Special Event for Actors, Writers, and Directors". The Total Picture Seminar. Retrieved July 16, 2017. ^ a b Barnes, Mike (July 16, 2017). "Martin Landau, Oscar Winner for 'Ed Wood,' Dies at 89". The Hollywood Reporter. Retrieved July 16, 2017. Riggs, Thomas (1999). Contemporary Theatre, Film and Television. Detroit, Michigan: Gale Research. ISBN 978-0787690458. Hellmann, Paul T. (2005). Historical Gazetteer of the United States. Florence, Kentucky: Taylor & Francis. ISBN 978-0415939485. Laufenberg, Norbert B. (2005). Entertainment Celebrities. Victoria, British Columbia: Trafford Publishing. ISBN 978-1412053358. Stewart, John (1994). Italian Film: A Who's Who. Jefferson, North Carolina: McFarland & Company. ISBN 978-0786467563. Welsh, James Michael; Phillips, Gene D.; Hill, Rodney (2010). The Francis Ford Coppola Encyclopedia. Lanham, Maryland: Scarecrow Press. ISBN 978-0810876507.
Who's Who in Entertainment. Wilmette, Illinois: Marquis Who's Who. 1989. ISBN 978-0837918570. Willis, John; Monush, Barry, eds. (2006). Screen World 2005 Film Annual. New York: Applause Theatre Book Publishers. ISBN 978-1557836687.